Most Vermont municipalities participate in a statewide retirement program that’s nearly fully funded. That’s much better than retirement funds are doing for many cities and towns around the country, which have found that they’re living beyond their means. But a few Vermont cities, including Burlington and Rutland, run their own independent employee retirement systems. And some of them aren’t in such good shape. So they’re looking for new, creative solutions to modify their plans – and close the gap before it becomes insurmountable. Inside Burlington’s City Hall all this month and next, City Council members will face reality. They’ll listen to accountants presenting slideshows that explain the city’s financial situation. They’ll crunch the numbers, trying to make them work. On a recent evening, as one of these budget work session droned on, Mayor Miro Weinberger stepped outside to get some fresh air. Standing on Church Street, he said he knew what it would take to accomplish what many voters elected him to do. "Fixing the city’s long-term finances requires addressing the pension issue," Weinberger said. In the short-term, Weinberger says the city is just working to pass a 2013 budget that doesn’t require any tax increases. Still, he is worried about and overwhelmed by Burlington’s pension debt. "We’ll make good on the campaign promises to address this early," Weinberger said. "I am encouraged in my preliminary work on the topic that there are some incremental, strategic changes that may be possible." Weinberger admits that’s campaign rhetoric. Cities and towns are expected to set aside a certain amount of money to cover future retirement expenses. Burlington has accumulated more than $55 million in outstanding pension debt, meaning it’s promised that much more in future retirement benefits than it’s got in the bank. In more conservative states, governors have launched aggressive but unpopular initiatives to help towns pay off their pension debt by limiting collective bargaining rights. 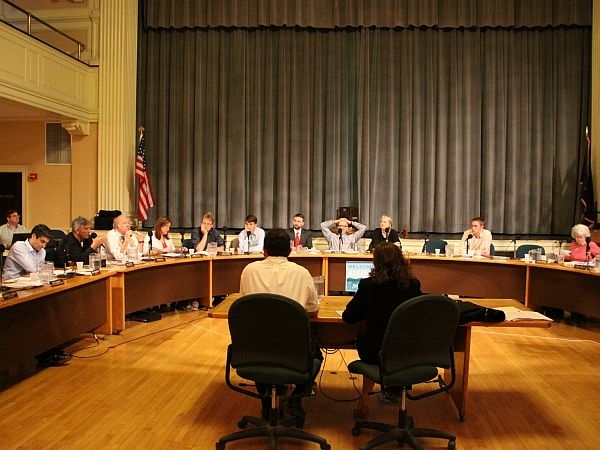 But in union-friendly Vermont, the issue is left to city officials. So Mayor Weinberger is not alone in wishing he had a solution to address his city’s pension scheme as municipal tax revenue falls flat. "It would be nice if [state officials] were in a position to be able to help out cities and towns that made promises years before. But they’ve got their hands full with their own pension obligations." Steve Jeffrey is the executive director of the Vermont League of Cities and Towns. He says even though Vermont enjoys one of the better funded pension programs in the country, it’s still struggling to fund its teacher retirement system. Jeffrey says towns with unfunded plans need to live up to their obligations. Jeffrey says there are some examples of cities that have restored their finances by restructuring their pension debt. South Burlington has borrowed using bonds to secure money to pay for its retirement system at a lower rate each year. "The infusion of cash into the pension plan took us from a severely unfunded pension plan to a plan that was funded at over 100 percent," said City Manager Sandy Miller. Two years ago, when the city first talked about repairing its pension debt, Miller says unfunded obligations totaled nearly $9 million. "A lot of this information had not been public before. So in 2010 when we disclosed all of this, it was very difficult for people to understand how it had gotten this way." In the end, South Burlington increased transparency surrounding how its pension plan is monitored; how the plan is administered and how it’s reported. Miller says the city now requires that its auditor and pension fund managers come before the board each year to talk about the plan. "The pain was tremendous but the outcome was also tremendous," Miller said. In next-door Burlington, pension debt will remain a tremendous concern as the city tries to pass a budget that doesn’t require a tax increase by the end of next month. A look into Vermont’s $3 billion unfunded liability for its pension fund expenses for retired state employees and teachers and an update on the investigation into a death of a patient at Brattleboro Retreat. State Treasurer Jeb Spaulding says the state’s public pension system needs to be reformed, and he’s optimistic that can be accomplished this year. In the next decade, the state employees and Vermont teachers’ pensions could fall short by a billion dollars.